Mussels prefer free-flowing rivers, so it was good long-term news for them in late November 2016 when a portion of the obsolete 111-year-old Dam No. 6 on the Green River in Mammoth Cave National Park suddenly washed away. But it was bad news in the short term because mussels live underwater, and the dropping water levels created by the collapse meant that some would be left high, dry and dead. There had been a lot of recent rain, so only a few hundred needed rescuing in the first few days. But by mid-December, with water levels dropping and a cold snap on the way, a larger effort was needed. About 45 volunteers, most from several state and federal agencies, gathered at the river with boats, rakes and plastic buckets. Monte McGregor, who is director of the Kentucky Department of Fish and Wildlife Resources Center for Mollusk Conservation, had already been down the river in a boat with a depth finder. He identified several areas where mussels would soon be exposed. Some spots were as big as a football field. “For four to five days as the water dropped and they got exposed, we picked up all the live ones we could find,” McGregor says. About 2,000 live mussels representing 33 species were moved to parts of the river where water still flowed. Two, the fanshell and sheepnose mussel, are endangered. The surprise was the five rare, round hickorynut mussels found on one shoal. 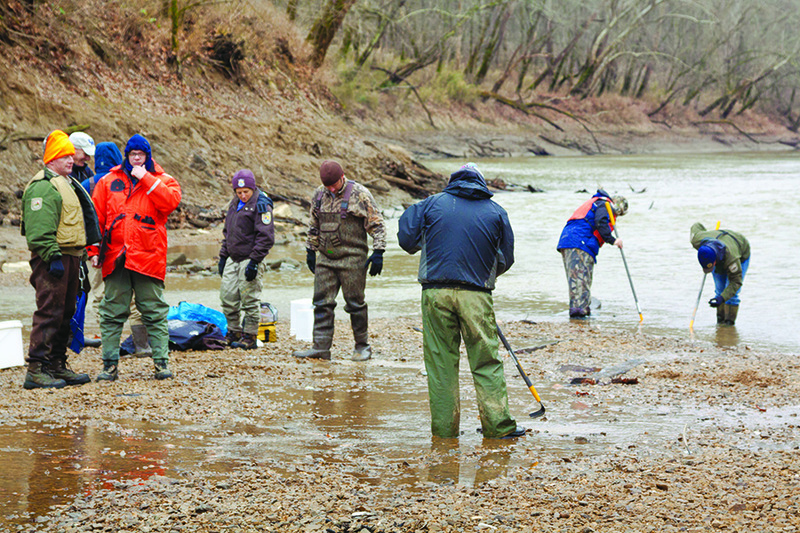 “I have not seen a live one in the Green River since I’ve been in Kentucky,” McGregor says. Because the dam had created a deeper pool, many of the mussels were species more commonly found in lakes. McGregor says river species are likely to increase now that the dam is gone. Dam No. 4 had already washed away in the 1960s. Plans call for more dams to be removed under a plan approved by Congress shortly after No. 6 washed away, says David Phemister, director of the Kentucky chapter of The Nature Conservancy. Green River Dam Nos. 1 and 2 will remain because barges pass through their locks to bring coal to a power plant. No. 3 will stay because it holds a municipal water supply. But Green River Dam No. 5, and a dam on the Barren River that flows into the Green, are on the take-out list. That is good news for the environment and efforts to promote ecotourism in the region, Phemister says. Because those removals will be planned, they are unlikely to spark an emergency mussel rescue.